Debuting at 100% is I.V.27. 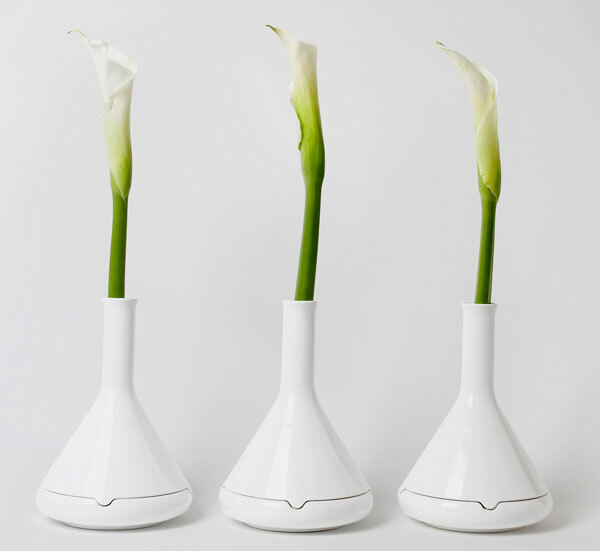 This modern plant pot offers a smart and elegant solution to watering plants with the refillable I.V. bag, just like its larger counterpart. Attractive sweeping curves create an elegant and attractive product that doesn’t compromise on functionality. Being 16cm high, it can accommodate varying heights and shapes of plants. With the sweeping entrance plenty of space is created to allow leaves and flowers to flourish, whilst also providing easy access to the pot. Like the full size I.V, the rate of water can be adjusted to suit the plant with the unique flow meter attachment. I.V.27 came to life after various requests from customers and retailers for a smaller version of the popular original planter. Any home or garden environment will be able to accommodate and nurture plants in this stylish white earthenware pot. The playful product of X-tray is a set of five ceramic pots that encourage people to get in touch with their green fingers. 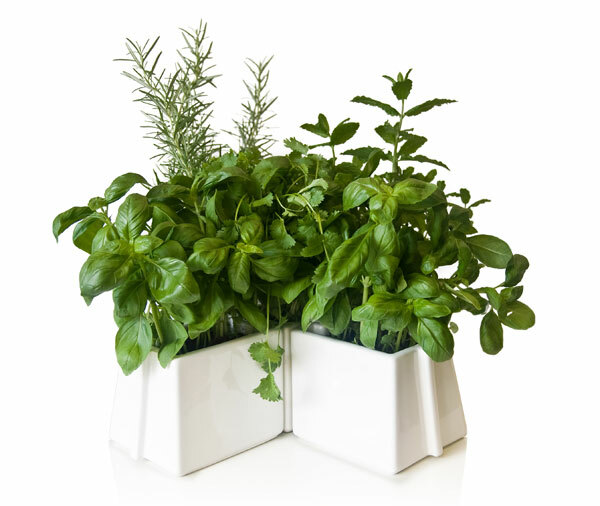 Growing plants is simple and we all know that home-grown herbs taste better and cost less. Whether you keep it in the garden or use it on a window sill, you can grow basil, mint, coriander and more. 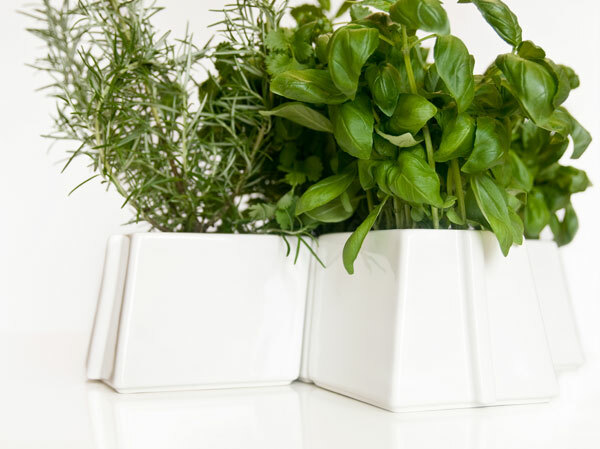 X-tray provides the basis of creating your own mini herb garden and having fresh herbs at your finger tips, giving a wonderful aroma to your kitchen. The modular nature of the five pots means that they can be positioned in a variety of ways including an “X”, “L”, “V” shape or in a straight line. The pots can also be used to grow small plants, flowers or wheatgrass. The various configurations mean that the pots will fit in corners, on window sills, alcoves, or as table centre pieces. Several sets of pots can be added together to create one great big green feature. Tab A and Tab B are dual-function products. 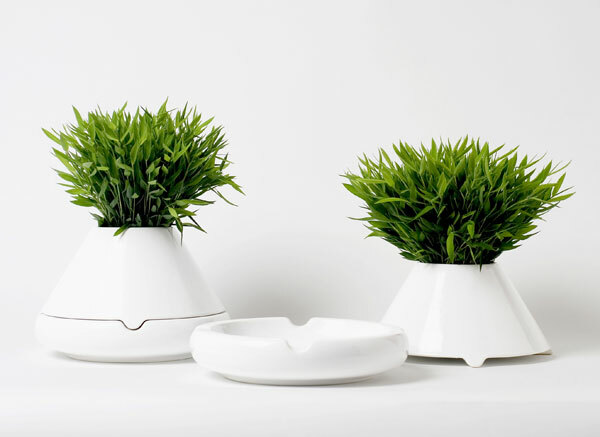 Tab A combines a vase with a small storage bowl and Tab B combines the bowl with a plant pot. The vase and plant pot sit on top of the bowl or can be used separately. The bowl is ideal for use as an everyday place to store coins and keys out of sight. The bowl of Tab A and B can also function as an ashtray, providing a pleasant disguise both visually and aromatically for cigarette ash. This is perfect for parties and pub gardens. I.V. is a self-watering plant pot that makes use of a medical drip feed. This unique characteristic allows the plant to be nourished with water and food as is required. The drip feed provides a striking design focus as well as acting as a reminder to its owner as to when it needs topping up. The drip feed also has a unique flow meter attachment which allows different settings, as some plants require more water than others. The product comes in both black and white. The I.V Pot tapers out at the bottom making it look more integrated with the floor and therefore fits comfortably into its surrounding environment. The high quality lacquered fibreglass has a perfect gloss finish as well as being lightweight and robust. 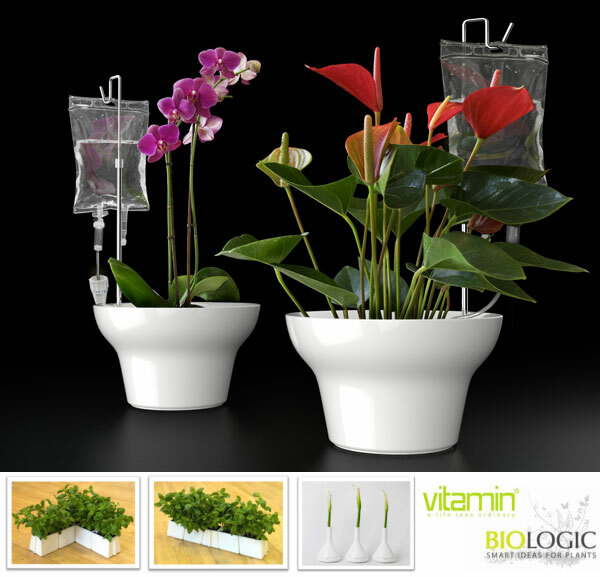 Vitamin is known for its unique approach to design and offers a plant pot with a difference in the I.V. Producing a mixture of pure and contemporary designs with a novel and quirky angle, Vitamin’s high quality products lend themselves well to any stylish environment. hmm… it looks sort-of strange actually. The flowers themselves are pretty, but not the iv. This modern plant pot offers a smart and elegant solution to watering plants with the refillable I.V. bag, just like its larger counterpart. The IV may be a good idea in theory but looking at it, I am not a fan. Anyone who has been in the hospital, or sat next to someone’s hospital bed while they were poked and prodded for an IV may agree with me. its just the vases and plants then?